The Amazon Spheres by NBBJ. Photography by Sean Airhart. Buckminster Fuller would likely approve. 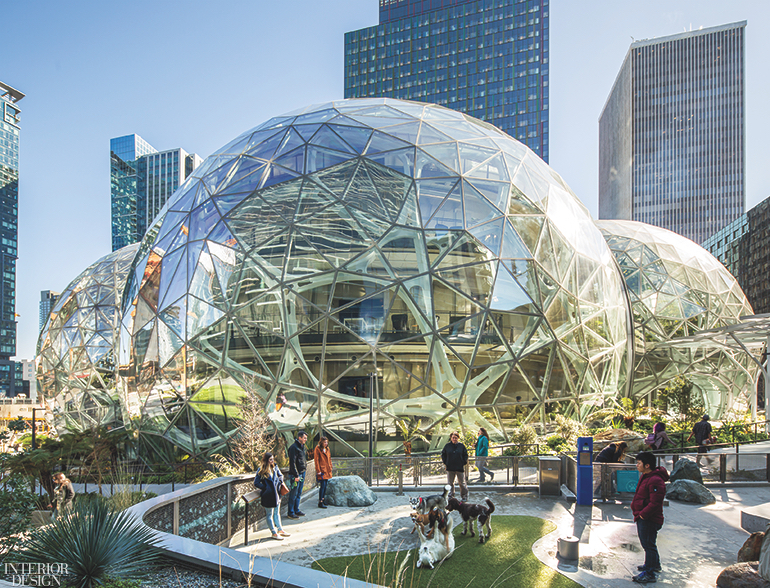 The Amazon Spheres, on the Seattle campus of the online retailer’s headquarters, are three conjoined domes in low-iron glass and painted steel. 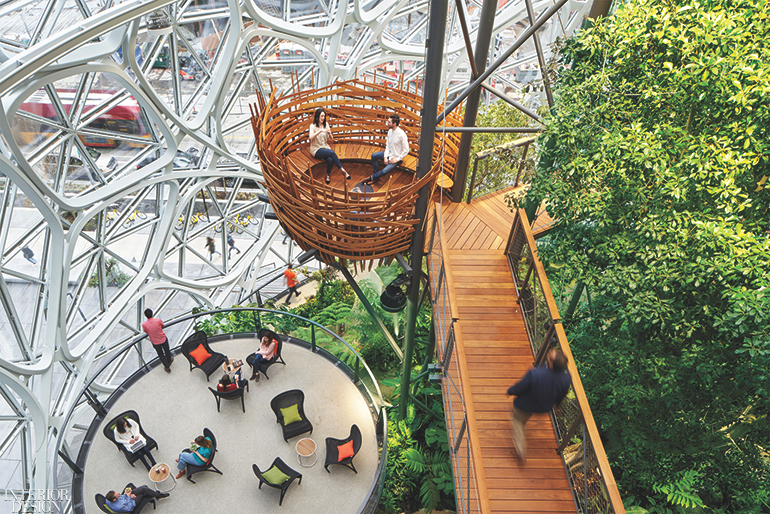 Designed by NBBJ, they total 70,000 square feet and function as an experimental workplace for Amazon employees (the restaurant, Wilmott’s Ghost, is open to the public). “It’s nature as an experiential conduit for productivity and wellness,” NBBJ interior designer Tara Schneider explains. 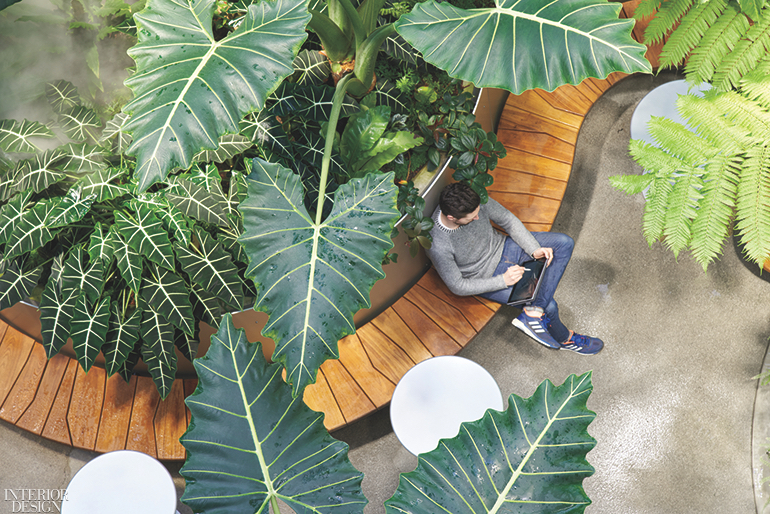 She’s referring to the project’s interiors, five levels of lounge and office areas surrounded by tens of thousands of living plants, some 400 different species like staghorn ferns and ficus trees, which come from tropical environments called cloud forests. Sounds from a stream and a waterfall are additional soothing elements that double as white noise. Perched high above is a bird’s nest–style aerie reached via boardwalk in black locust slats. Even the architecture follows biomimicry: The circle is said to be the only elemental geometric form found in nature. The Amazon Spheres by NBBJ. Photography by Bruce Damonte.